Animal Friends Presents: Baby-Ready Pets! Today we have a special guest blog from Animal Friends, our featured guest on tonight's episode of "No Fee TV." Tonight the topic is dog safety and injury prevention, and the blog below outlines tips for introducing your dog to a new baby. 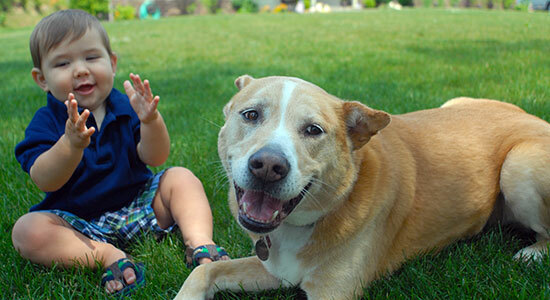 Anyone who has a dog or a baby who will be around dogs should check it out – training, preparation, and knowledge are key when it comes to dog bite prevention. Make sure to tune in to "No Fee TV" tonight at 7:30 pm – you'll learn more prevention tips and meet some of the dogs available for adoption at Animal Friends. One of our partners, Jason Lichtenstein, will also be on hand with important information like leash laws and your legal responsibilities as a dog owner. We want you to call in with any questions you have, so dial 412-333-PCNC between 7:30 and 8:00pm and ask away. The excitement of preparing for a new baby should not be dampened by concerns about your pets' reactions. With some planning, preparation and training, introducing your newest family member to your pet can be very successful and rewarding. Animal Friends offers a free, monthly Baby-Ready Pets! Workshop to assist you in making the preparations for these introductions. Seating is limited and advance registrations are required, so register online today at www.ThinkingOutsideTheCage.org. Stop bad behaviors early! Starting practicing good training as soon as that pregnancy test turns out to be positive (and you have a lot more time on your hands!). Try to incorporate any changes before the baby comes. If you do not want the dogs and cats to be on furniture or in certain rooms, start enforcing this long before the baby comes. This way, the pets won't associate the baby with their new restrictions and the boundaries will be enforced and understood by the time you are busy with a baby. Have dad bring home a receiving blanket early with the baby's smells on it. Set all of your baby supplies out early, including the Pack n' Play, toys, mats, swings, the crib, etc. By the time the baby came they were normal pieces of furniture to the pets. Get your pets accustomed to baby noises and smells. Wear baby lotion on your hands and download and play sounds of babies crying. Plan for a pet sitter! You probably won't know when you'll be going to the hospital, but it's important to make sure you're prepared. Also, just as you would prepare a hospital bag for mom in advance, pack one for your pets regardless of whether someone is coming to your home or if you are dropping them off somewhere. Ready your treats, food, toys, bowls and other supplies so you don't have to worry on the big day (or night). Incorporate the baby and the pets into your daily life. If you can, take walks with both your dog and baby. Never leave your baby alone with the pets. Even if you know your pets would never do anything on purpose to hurt the baby, they still need to learn appropriate behaviors. Make sure your pets are getting enough exercise. Pent-up energy isn't healthy for us or them. Pets who get enough exercise are much calmer. Make sure mom pays attention to the pets--not just petting but walking and feeding them too. It doesn't have to be every time, but it helps if there isn't a complete abandonment of these duties. To that effect, when the baby comes home, make sure dad brings the baby in the house and mom comes in and greets the pets. Spoil your pets! They might be nervous, over-excited, and confused. Your attention will also be diverted to the baby and away from the pets. Having some special chews and toys to give them during the first couple of weeks can go a long way to making sure your pets feel loved. Long-lasting chews like bully sticks, Himalayan Dog Chews made from yak cheese, and puzzle toys, as well as new catnip or interactive cat lures and chasers, will not only keep your pets busy, but it will buy mom and dad a few minutes of peace. It will take some time to integrate your new baby into your home, but making sure your pets are less stressed, feel cared for and are part of the family will go a long way to making them feel more comfortable around your new bundle of joy. Learn all about these tips and many more at Animal Friends' Baby-Ready Pets Class! Visit www.ThinkingOutsideTheCage.org.